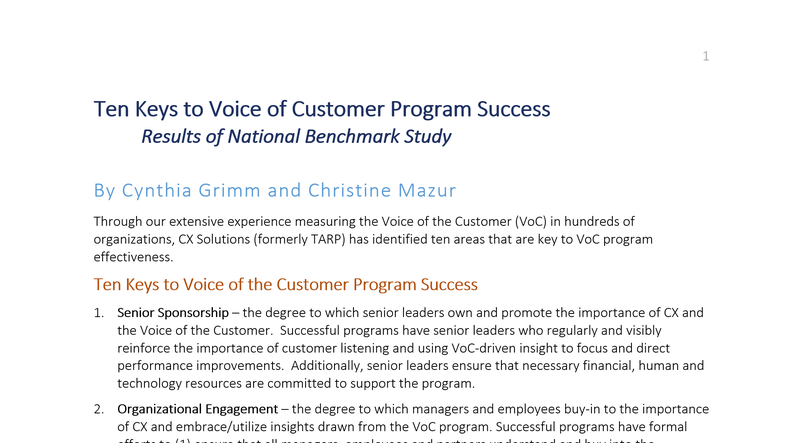 Over the past several weeks, CX Solutions and Voice Crafter have been sharing results of our 2016 Benchmark Study of Customer Engagement. We’ve provided a definition of Customer Engagement, tried to demonstrate why it matters, revealed some of the brands that are CE leaders, demonstrated the impact of effective contact handling, and last week, stressed the importance of coaching to the behaviors that drive engagement. Clearly some companies stress the importance of and coach to behaviors that lead to high levels of engagement. 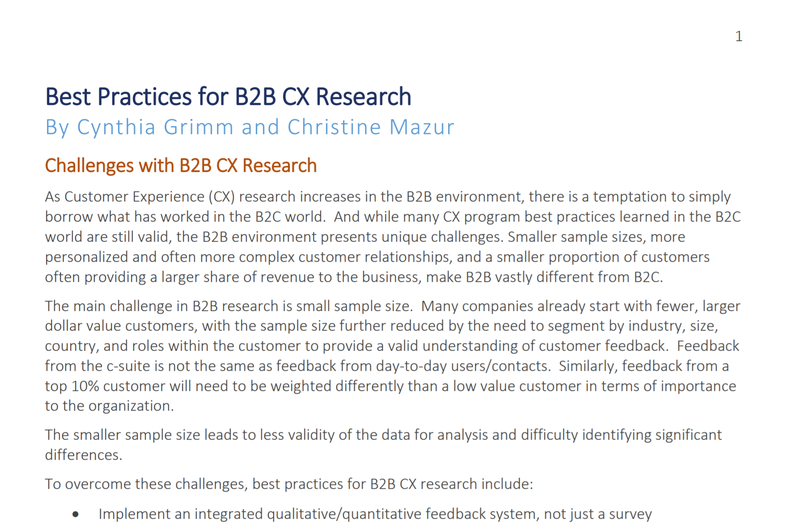 Chick-fil-A, for one, surpasses KFC with respect to customer engagement, primarily attributable to superior customer services and to the way employees treat and engage with customers (Lessons from a Customer Engagement Leader). Similar findings were seen when we compared Verizon and Comcast results, with 81% of Verizon customers mentioning something positive about customer service and/or customer care, compared to only 19% of Comcast customers. In this installment of our blog series, we continue to compare CE leaders against other companies, turning our attention to the airline industry. We surveyed customers of four airlines, and results are shown below. 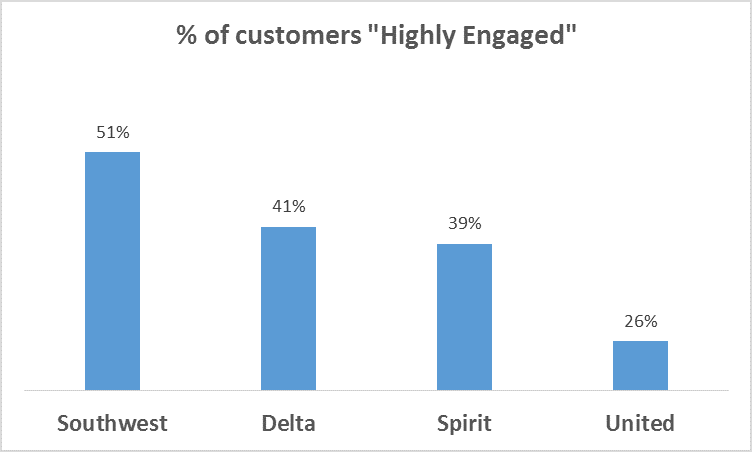 First, note that the percent of customers “highly engaged” with Southwest Airlines is almost double that of the laggard in this category, United Airlines. Although most people (78%) still choose “Price” as the primary reason for using Southwest airlines over competitors, when asked their satisfaction with various elements of service, the primary differentiators were “ease of doing business with” and satisfaction with “staff/employees.” This might indicate that although price is important for the initial selection of Southwest Airlines, staff and service levels are what keep Southwest customers engaged and coming back. 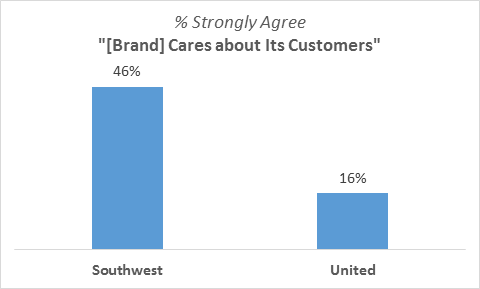 This is illuminated even more when looking at brand attributes, with 46% of Southwest Airlines customers “strongly agreeing” that Southwest Airlines “Cares about its customers”, whereas only 16% of United Airlines customers feel the same way. Although a handful of United Airlines customers noted “customer service” or “quality of customer service” as a differentiator, none mentioned specific incidences of employee treatment, just overall service levels. The emotional engagement does not appear to be present, even for “satisfied” United Airlines customers. This is clear in both the results of our benchmarking as well as the customer comments. So what do Southwest Airlines and other CE leaders have in common? Second, CE leaders focus on their employees (in hiring practices too) and empower them to do what’s in the best interest of the customer. For example, it’s not uncommon to hear stories of Southwest pilots ordering and paying for Pizzas for their passengers to keep passengers happy when a plane has to be diverted. Since their people are hired and trained according to the company’s customer service standards, they can be confident that the employee will make the right decisions and create a satisfied and engaged customer. We’ll be sharing more findings from our 2016 Benchmark Study of Customer Engagement next week. So, please stay tuned! Gallo, C. (2013). “How Southwest and Virgin America Win by Putting People Before Profit”. Retrieved from com.